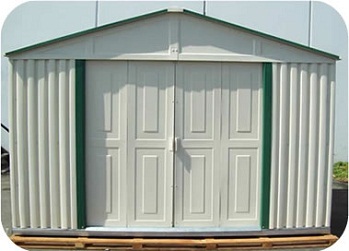 Free shipping for this 20211 vinyl utility building shed when shipped to the lower 48 states. An affordable and attractive shed to provide you with all your storage needs. Neutral color with an earthy green trim. A great way to expand your storage area and protect your garden and outdoor tools. Wind-tested and hold large amounts of snow' easy 2 person installation. A great addition to any home. Measures: 123" x 92" x 85"
Foundation kit is made with galvanized steel, see picture above. Foundation kit does not include plywood. Available without foundation kit 20211 or with foundation kit 20214. A foundation kit is necessary if you are not building it on concrete or a similar surface. This product ships via an LTL freight carrier for a curbside delivery. This type of delivery means the customer must be present to sign for the delivery and to unload the product from the truck and take it where you need to on the property. The driver will not assist in this process. Please have sufficient people present to assist you in this process. The weights and sizes of the boxes for this shed are shown below. Box 1: 72 inches x 41 inches x 6 inches; weighs about 250 lbs. Box 2: 72 inches x 40 inches x 3 inches; weighs about 80 lbs. If ordered with the foundation kit-foundation kit dimensions: 70 inches x 6 inches x 6 inches; weight 45 lbs. Competitive Edge Products, Inc. is an authorized distributor of Duramax 20211 storage garages. Fast Shipping: Orders for the 111 Mammoth Teton Queen-Size Sleeping Bag generally leave the warehouse the next business day. Dimensions: 72" x 41" x 6"